The above quote was The Alemonger’s response when I asked if he’d seen Ballast Point’s Pineapple Sculpin in the South Jersey beer aisles. He sure does make it sound like he’s quickly tiring of the odd concoctions that America’s brewers are coming up with these days. “Can’t I just have a good old-fashioned IPA, Stout, or Pale Ale? Why does all this weird stuff keep getting into my beer?” is what I think he’s saying to himself as he wanders through the beer aisles in search of some Craft Beer normalcy (I’m sure his version of these thoughts would have been said in Khoisan click language, not something as pedestrian as English). Given what I know about The Alemonger and his eclectic taste in just about everything, I don’t really believe that he’s tired of all these wacky beers. In order to delve deeper into his “sophomoric brewing” comment, The Alemonger and I plan on having a lengthy beer chat very soon which we’ll share with you in an upcoming blog post. My apologies in advance. 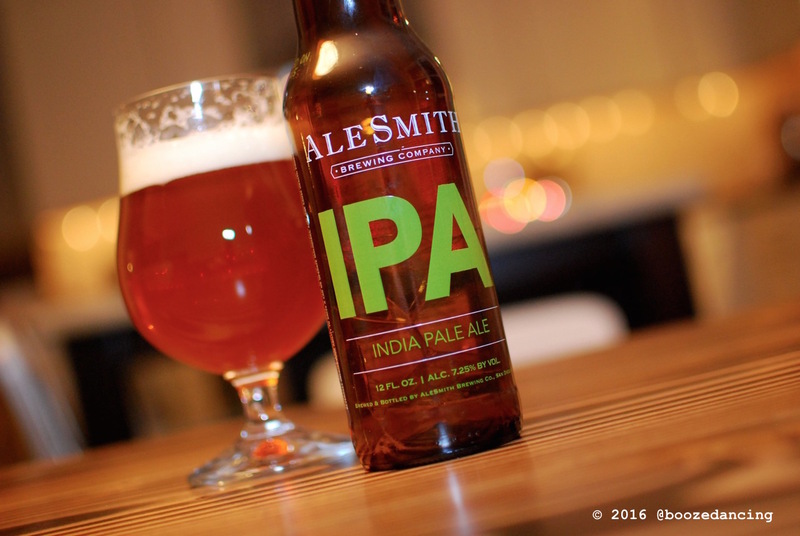 In the meantime, let’s get back on track and talk a bit about the decidedly un-funky beer that is the subject of today’s post: AleSmith Brewing Company’s IPA. Just so you know, when I say un-funky, I mean that this beer is made from just hops, barley, yeast, and water. No herbs, fruits, or small wooded animals were harmed in the making of this beer. It’s Pretty Awesome. A San Diego classic, AleSmith IPA showcases the versatility of American hops. Aromas of grapefruit and tangerine lead into an abundance of fresh pine and tropical fruit notes followed by a crisp, resinous bitterness. The complex hop profile is supported by a firm malt presence to create an incredibly flavorful and well-balanced IPA. Appearance: Slightly cloudy red-orange color. The foam on this beer is spectacular! It builds to a height of 1.5 inches and stays put for several minutes. As it dissipates, it leave behind oodles of sticky lacing. Aroma: While’s there’s no doubt that a healthy dose of hops were used during the brewing of this beer, there’s also a good bit of sweetness coming through in the nose. I’m getting grapefruit and piney hops followed by honey and biscuity malts. Taste: Smooth and creamy mouthfeel with a silky smooth carbonation. Starts off somewhat resiny and dry with a firm hop bite. In the middle, some sweetness kicks in to level things off. Smooths out at the finish with a balanced blend of bitter and sweet flavors. Some bitterness lingers in the aftertaste, but overall it’s quite crisp and clean. I’ve heard many great things about AleSmith (their Speedway Stout in particular gets all kinds of praise, i.e. it made the Imperial Stout Top 10 list on both Beer Advocate and Rate Beer), yet for whatever reason, I’ve never had the opportunity to try any of their beers. If the rest of their line up is as good as their IPA, then it looks like a beer run to pick up more AleSmith is in order. I really liked this beer and found it to be very well balanced and easy drinking, which is really saying something given it’s moderately high ABV.